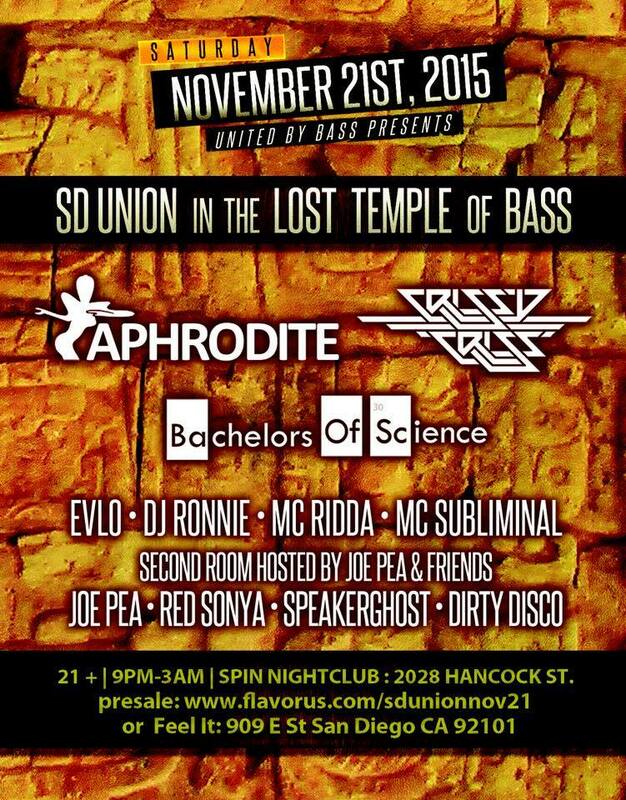 Download and listen to the live recording of DJ Red Sonya’s set from SD Union in the Lost Temple of Bass presented by United by Bass at Spin Nightclub, Saturday, November 21st, 2015. Red Sonya played the House room alongside DJs Joe Pea, Speakerghost & Dirty Disco, while headlining Drum & Bass DJs Aphrodite, Crissy Cris and Bachelors of Science crushed it in the main room. It was a night to remember! February 17th, 2017, Sonya has been invited back to play at United by Bass & SD Union’s new party called “We Love Bass” located at Blonde bar. D&B headliner LENZMAN from MetalHeadz is making an appearance and it’s an intimate venue so get your tickets now to reserve your space on the dance floor! Thanks for listening! Leave a comment and share with your friends!